With Honey and her fellow mallard inhabitants of Botany Pond in Chicago having flown the coop, and Jerry having done so himself for a few days, I had to travel north to Milwaukee to get my ration of duck feeding. There, on a visit with my vertebrate zoology class to the Milwaukee County Zoo, I was able to see Laysan Teal (Anas laysanensis) feeding. Laysan Teal are relatives of mallards, and were once widespread in the Hawaiian archipelago, but were restricted to the small northwestern island of Laysan by the time of their scientific description by Lord Rothschild in 1892. They are still considered endangered, but other populations have been established by translocation within the Hawaiian Islands, and their numbers are now increasing. They do breed in captivity, and five ducklings were hatched at the Milwaukee County Zoo earlier this year. Laysan Teal at the Milwaukee County Zoo, November 3, 2018. The Teal are in the Aviary at the Zoo, in the Wetlands Hall, a large room with a “stream” running through it, surrounded by trees and herbaceous vegetation. Birds of several species fly about the hall. 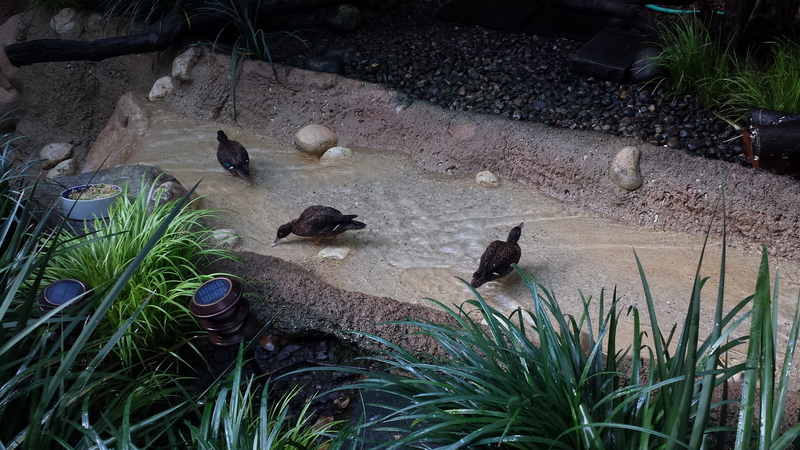 The teal prefer the shallow part of the stream. This entry was written by whyevolutionistrue and posted on November 5, 2018 at 11:00 am and filed under birds, ducks, zoos and aquaria with tags ducks, Laysan Teal, Milwuakee County Zoo. Bookmark the permalink. Follow any comments here with the RSS feed for this post. Both comments and trackbacks are currently closed. That’s a pretty iridescent green (teal?) speculum. It only shows up a couple times on the video. Thanks for sharing; I’ve never heard of this species, and had no idea indigenous quackers inhabited Hawaii. The color teal is named after the duck (not the other way around). Delighted to see they are recovering some of their lost territory. I wonder how they ever got to the Islands way out in the middle of the Pacific ocean. Hawaii gets wayward water birds, shore birds, even raptors nearly every year: ducks and geese are pretty common. Participating in the Audubon Xmas Bird Count one year, high up on a mountain ridge, we saw a Peregrine Falcon! Fortunately for our credibility, it was widely seen in the following weeks. There is a Hawaiian duck, Anas wyvilliana, on all the main islands; according to wikipedia, it is monochromatic (both sexes look like a female mallard) and non-migratory. One of the biggest threats to it is hybridization with feral mallards. According to wiki, experts now consider it a “good” species, not just a sub-species. But wiki also says it was formed/produced by a hybridization between the Laysan Teal and the Mallard. Is that really a mode of speciation? About a mile from my house I can see the Hawaiian Coot, Haw’n Gallinule, Haw’n Black-necked Stilt, and Black-crowned Night Heron. The latter is considered identical to its mainland relatives; the first three have evolved to sub-species status. Thanks for a lovely post, Greg! I needed that.